Turmeric is the fastest growing health food around the world as millions of people are adding it to their diet for its health-promoting potential. 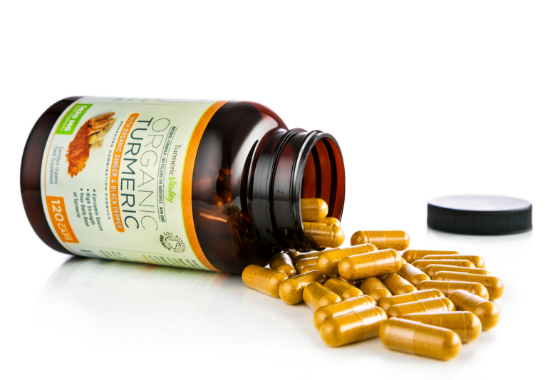 There have been over 5,000 peer reviewed studies on turmeric and 10,000 on its main compound Curcumin. 1. How much to take: The most common amount of turmeric recommended is 1 teaspoon full. This is what most health and nutrition experts advise and is also in line with the University of Maryland Medical Research Center's recommendation of 1-3g per day. 4. Eaten with Fat: The active compounds in turmeric are fat soluble so it's important that turmeric is taken with food. Fat soluble nutrients bind to fat before they can be absorbed through your digestive lining. Most meals are fine but taking turmeric with something very low in fat like a banana would not be effective. 5. 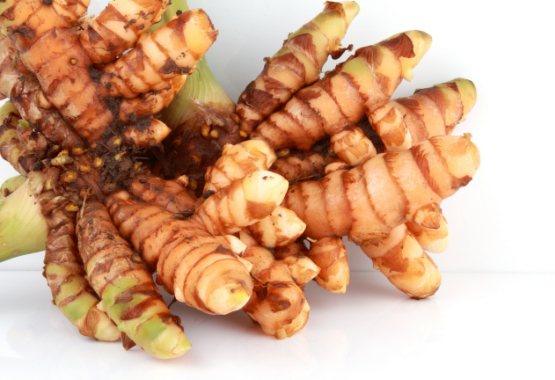 Make sure your turmeric is high quality and pure: As turmeric has increased in popularity it is now in high demand and there are a lot of low-quality products that are not tested for purity and contain additives. So, now you know you should be taking around a teaspoon of turmeric per day, split into two doses, mixed with black pepper and eaten with food to bind to the fats. If you absolutely love curry then you have no problems, one for breakfast and dinner will achieve this nicely. You can also add turmeric to whatever your meal is, you just need to be very creative when it comes to your preparation as turmeric doesn't go with everything and can get very repetitive quickly. Lots of people simply don't have the time to prepare special turmeric recipes on a daily basis or it just doesn't fit with the foods they're eating. We're big fans of turmeric but so far we've not managed to find a breakfast it goes well with and even lunch is a struggle. If this doesn't look like something you want to tackle everyday then keep on reading, we have the perfect solution for you. 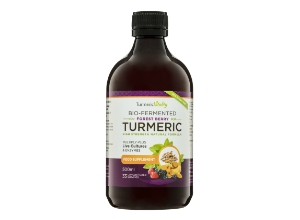 Turmeric Vitality is the UK's specialist turmeric brand. 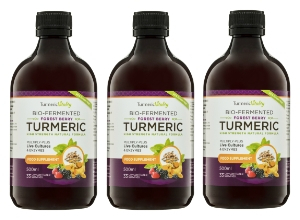 We work exclusively with turmeric which allows us to focus 100% on creating the absolute best products that make turmeric easy and effective to add into your diet. 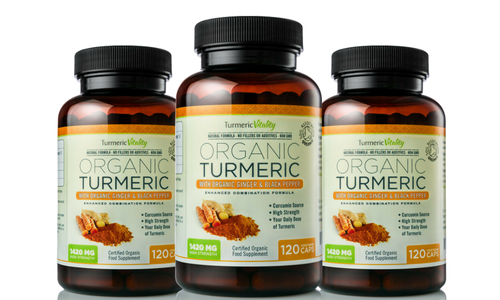 Our certified organic high strength turmeric capsules can be taken with any meal at any time of the day, no preparation, no mess, no taste. You can easily take up to a teaspoon of turmeric with only two servings of capsules. Now adding turmeric to your breakfast and dinner is easy! Enhanced combination formula with optimal proportions of organic Black pepper & Ginger to assist the absorption of turmeric into your body. Certified Organic with zero fillers, additives, flowing agents and tested for purity and heavy metals. 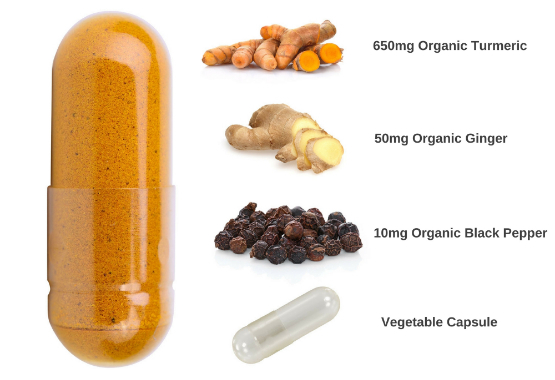 And for the people who don't like swallowing capsules we have a revolutionary new way of taking turmeric..
Bio-fermented turmeric is a unique combination of Turmeric combined with 6 Billion diverse live cultures! 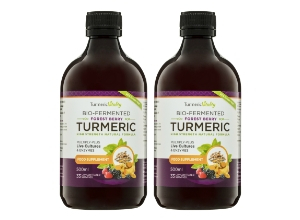 Enjoy your daily turmeric like never before in a delicious liquid with ginger, black pepper and papaya fruit and leaf extract; rich in papain digestive enzymes. Using 8 strains of diverse live cultures and a 5 stage fermentation process, our formula predigests the active ingredients to create a complex liquid that is easier for your body to absorb. Papaya forms the base of the liquid as it is rich in enzymes and perfectly balances the taste of the spices. We also add delicious Berry flavour from Maqui and Elderberries. 99% Sugar Free! The best part about fermentation is not only the fact it predigests the compounds so your body can take a shortcut to get the active compounds, it also removes the natural fruit sugars as the bacteria convert it to beneficial lactic acid. 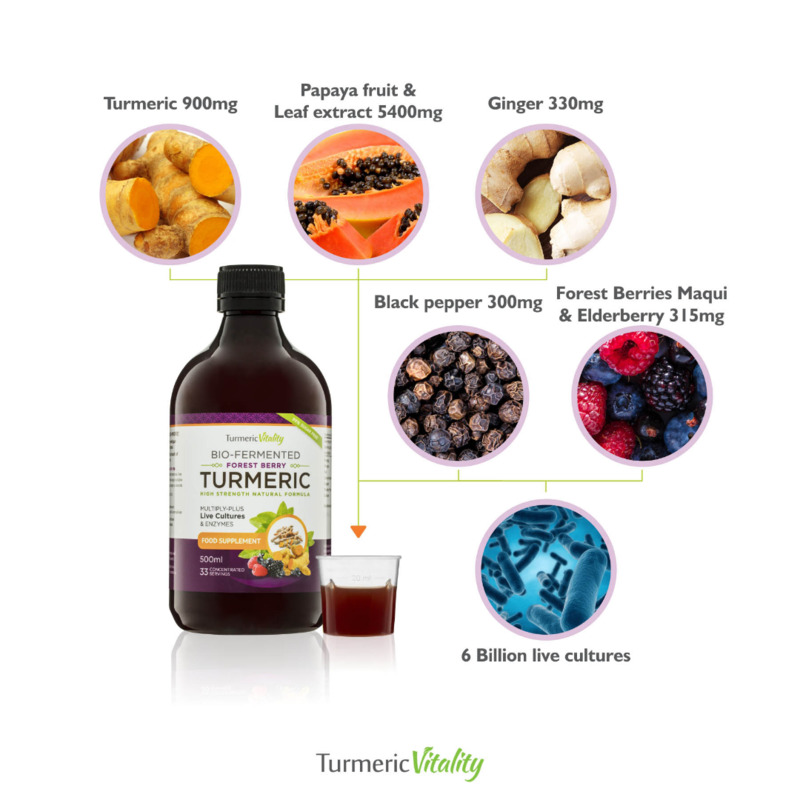 Turmeric 900mg, Ginger 330mg, Black Pepper 300mg, Papaya extract 5400mg, Elderberries, Maqui berries. 6 Billion Live cultures from 8 Diverse strains. THANK YOU! I love the Forest berry liquid, it is my new favourite guilt free treat. I've wanted to take turmeric for a long time but never really like the taste so this is a blessing for me. I notice the difference if I forget to take it one day. 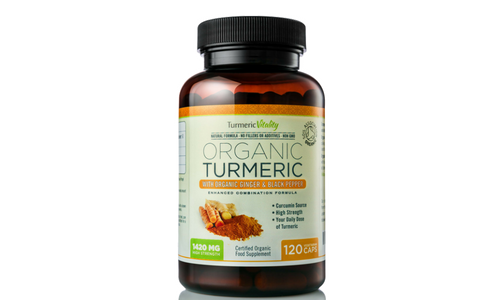 Turmeric is great stuff, I have been using the capsules for 5 weeks now and I have nothing but good things to say. I will be a customer for life as turmeric is something we should all be taking but not enough people do. My whole family now takes these even my mother who is 92! 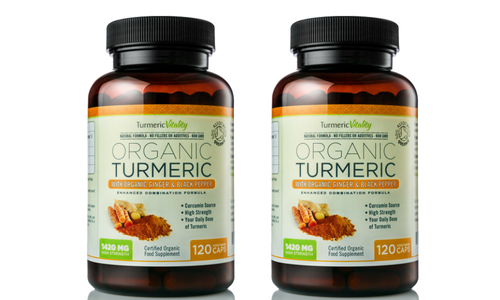 Thank you Turmeric Vitality. I have cooked with herbs for a long time but I always struggled taking enough, especially when things get busy. 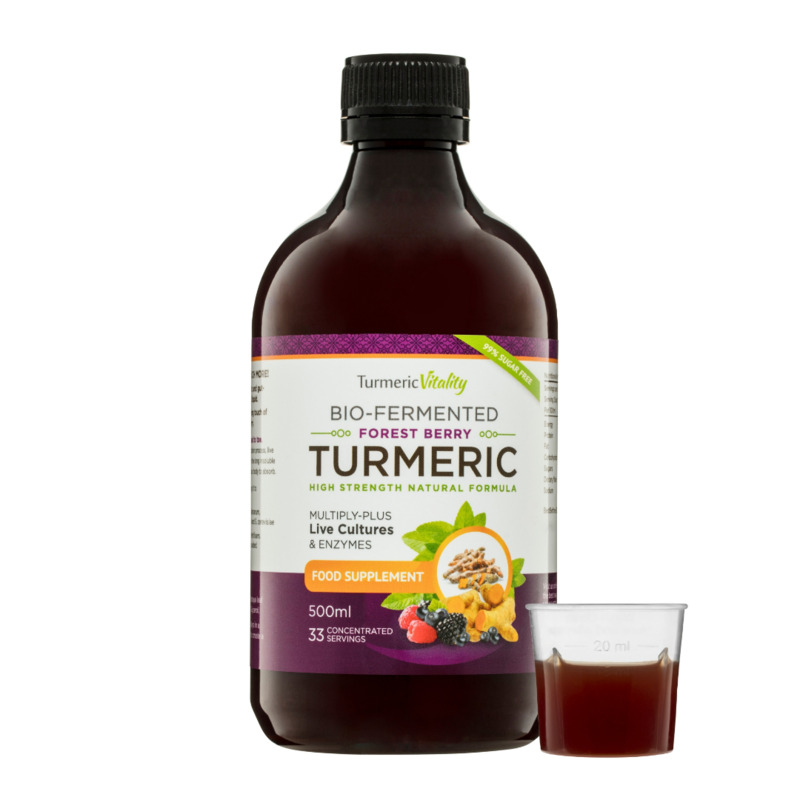 I now take a shot of berry turmeric in the morning and then capsules in the evening and I've not missed a day yet! Of all the foods and supplements I have taken nothing has been as effective as turmeric. Highly recommend. Turmeric is now a permanent addition to my daily diet. I wish I discovered this amazing spice a long time ago. The idea of adding it to my food does not appeal to me so I'm very happy to have it in a capsule format and the combination of ingredients alongside turmeric is superb. You can smell the freshness and quality as soon as you open the bottle. Fantastic product!